Designed to allow an easier transition of wheelchairs or scooters from one surface height to another. 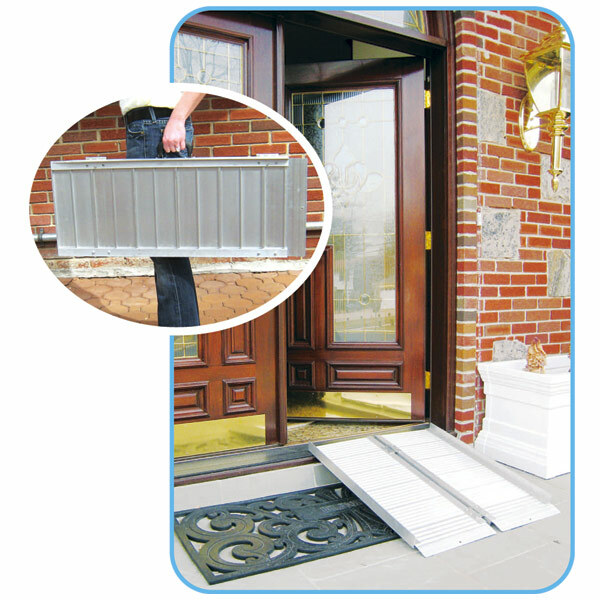 The single-fold ramp with built-in carry handle is easy to fold in half and transport. Features perforated slots to keep water from collecting on ramp and durable, lightweight construction. Available several lengths to meet a variety of elevation changes. Measures 4 ft. long X 30 in. wide. Folded size: 4' Long X 15 Wide X 3 Thick. Weight: 21 lbs.Includes carry bag. Made of Aluminum. Weight capacity: 600 lbs. Limited Lifetime Warranty.